Padres Pedal the Cause is a one-day event that raises funds for cancer research at Rady Children’s and other San Diego research institutions. With the support of passionate fundraisers, sponsors, and volunteers, Pedal raises much-needed funding for life-saving cancer research through the annual challenge that includes four cycling courses, spin classes, and a 5K walk/run, all finishing centerfield at Petco Park on November 16. To join us on November 16, please register here (online registration coming soon). 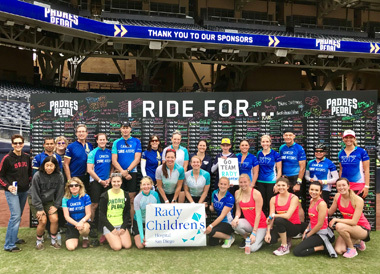 In partnership with Rady Children’s Hospital, Padres Pedal SuperKids is a special program that brings children who are currently in cancer treatment together with Pedal teams of participants who ride, fundraise and celebrate in their honor. Teams and families form meaningful bonds that transcend the event and bring inspiration and hope to everyone involved. These brave young cancer fighters have a one-of-a-kind experience on event weekend as they rally together with the entire Padres Pedal community and are recognized on the field at Petco Park. Learn more about the SuperKids program here.